Avigdor Liberman says Israel 'in favor of negotiations' as long as terrorists remain in prison. 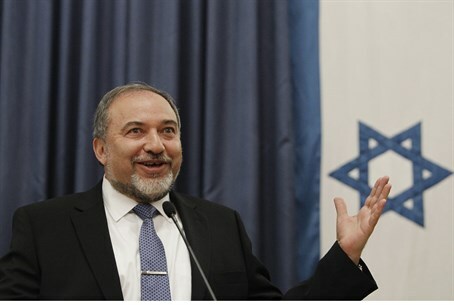 Foreign Minister Avigdor Liberman (Yisrael Beytenu) stated Tuesday morning that he is not against continuing peace talks - but only on Israel's own terms. "I am all for negotiations, but I am against being a sucker," he stated, in an interview with IDF Radio. "It cannot be that the Palestinians unilaterally break all the rules, submit a request to join the fifteen international organizations, and then we treat it as another day [in the Middle East]." "We are in favor of continuing the negotiations, but the previous proposal for the release of prisoners will not be offered anymore," he added. Liberman has previously supported continuing talks, but has also said that Israel's future does not depend on them - not enough to torpedo the government by releasing more terrorists. "We have something waiting on the political horizon, and it does not have to be the Palestinians," he said Sunday. "If they do not want to negotiate we do not need to chase them and not make any 'gestures,' if [they] do not want to negotiate it's [their] decision and [theirs] only." The Foreign Minister also related to comments he made at the Jerusalem Post Conference on Sunday, whereby he said that he would rather see a new round of elections, and a new government, then see terrorists released - a move the Opposition took to heart on Monday night. "We have no interest in new elections, each party prefers to run the country and not be busy with elections," Liberman said, dismissing calls by Opposition MKs to form a new government. "However, if the alternative is to enter into a tailspin in the coalition - such as the ultimatum Amram Mitzna gave the government this week - then this is unacceptable." On Monday morning, MK Amram Mitzna (HaTnua) claimed that “more than half of the government ministers are torpedoing the negotiations" and threatened to pull out of the coalition over the talks. "We no longer have anything to do [in the coalition]," the MK stated. "If the talks do not resume by the end of April, HaTnua should leave the government immediately." Sources close to Prime Minister Binyamin Netanyahu played down Liberman’s threat on Sunday evening, saying "Yisrael Beytenu is unlikely to leave the coalition in the forseeable future."